Marko Arnautovic has returned to training at Rush Green this morning a club insider has confirmed. It is the 29-year-old first return to the training ground since he was left out of the squad that travelled to Bournemouth with Sunday and Monday’s being days off the whole of the first-team squad. The club insider was keen to point out that Marko has not missed a single day’s training since the story of a proposed move to China first broke and he has trained professionally throughout that period. West Ham are preparing for their FA Cup game against AFC Wimbledon this weekend followed by a Premier League game against Wolves on Tuesday evening. At this time, Marko is part of those preparations with Pellegrini insisting that the selection of his 18 man match squad is based on how players train in the week before the match. Last week both Mark Arnautovic and Lucas Perez were dropped from Pellegrini’s squad. 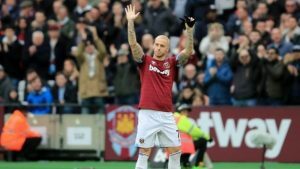 Despite the news that the deal to China is off for Marko, West Ham are preparing themselves for more possible twists and turns in the Arnautovic saga before the transfer window closes. So what if he hasn’t missed a days training that’s not the issue.The issue is that he has got to sort his head out. Keep him till the end of the season and then get rid. It has to be a full first team 11 to Face Wimbledon in the FA Cup if West Ham are serious about winning anything . Anautovic doesn’t belong anymore so , any full team without him doesn’t matter . Just as long as Pelligrini doesn’t let us down by putting out a rotated and weakened team . The FA Cup may not be important to some , but to us Fans it’s Megga . We deserve to see a fully committed West Ham United . You can’t win the FA Cup in China . Wimbledon will be taking this game very seriously,,,, and so should we . Could be a chance of Europe and the opportunity shouldn’t be thrown away . Don’t really want to see Anautovic celebrations . He was West Ham but he ain’t now . The manager will decide whether he plays on Saturday and Tuesday or not depending on how he trains. For me, he’s such an important player for us that if he’s fit he should play, whatever the competition or opposition. He hasn’t been disrespectful to the club or the fans, and he hasn’t missed training or feigned injury. He’s a Hammer until he leaves. China is a horrible place to live and work, but the financial benefits for a professional footballer are huge. Good luck to him if he goes, he’ll need it. Well when Marco was injured,We went on to have our biggest run of wins and even broke a record or two, so it won’t be the end of the world when He does leave. Doesn’t matter how important a player Marco was for us, he will be gone if not in this window, the next. I believe we played better as a team when he was out with his bad back or calf or whatever it was. Everyone was chipping in and there was a great team spirit. We had a greater win percentage without him and we hardly missed him. Even in the recent Arsenal game when he was back playing he was hardly involved. Now I think his situation has caused uncertainty and affected the morale of teammates and fans alike. It’s not all about Marco. Time for him to go.